Anson Tyler Hemingway, the son of Allen Hemingway and Harriet Louisa Tyler, was born in East Plymouth, Connecticut on August 26, 1844. The family came to Chicago in 1854 and within ten years all three Hemingway brothers had enlisted for service in the Civil War. Anson served in the Army as a private with the 72nd Illinois Regiment. Organized in Chicago in 1862, the "Chicago Board of Trade" regiment was involved in Grant's Vicksburg Campaign, participating in the move down the Mississippi Central Railroad, the Yazoo Pass Expedition, the Battle of Champion Hill, and, finally, the Siege of Vicksburg. 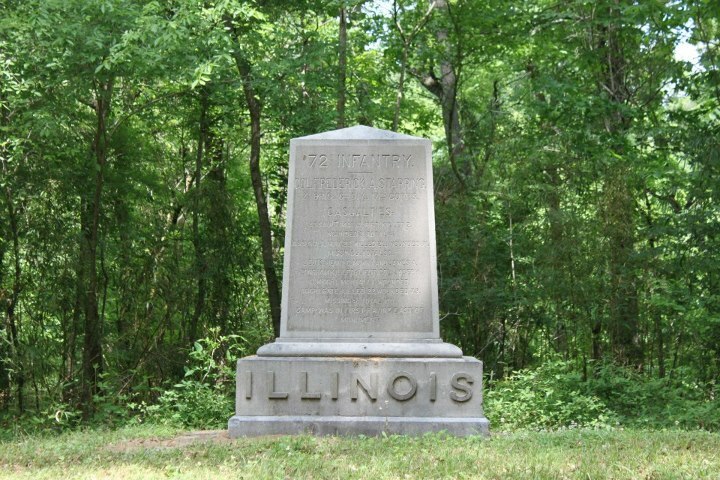 The regiment's monument at Vicksburg (below) is located on Union Avenue near the Wisconsin monument. After the fall of Vicksburg, the regiment remained in Mississippi, serving as a occupation unit until the fall of 1864, when they were sent to Tennessee. By that time, Anson Hemingway had re-enlisted in the 70th United States Colored Infantry, Regiment, where he served as a 1st Lieutenant and provost marshal of the Freedman’s Bureau in Natchez. A letter written by Hemingway in May, 1864, from Vidalia, Louisiana, illustrates the vicious nature of the war in the area. After scouting for a party of Confederate guerrillas, Lt. Hemingway noted that a company of black Union cavalry caught and executed all seventeen of thier prisoners. "When the guerrillas were first seen," he wrote, "the colonel told them in a loud tone of voice to 'Remember Fort Pillow.' And they did: all honor to them for it. If the Confederacy wish to fight us on these terms, we are glad to know it, and will try and do our part in the contest. I do not admire the mode of warfare, but know of no other way for us to end the war than to retaliate." Lt. Hemingway survived the war, but his other brothers both died. After his time in the military, Anson attended Wheaton College, founded in 1860 by the Illinois Wesleyan Methodists from an earlier institution established as an anti-slavery school in 1853. After two years of study at Wheaton College, Hemingway left to become general secretary of the Chicago YMCA, where he remained for ten years. During this period, the Chicago YMCA constructed not one but three headquarters buildings. After building the first one in 1867, it was lost to a fire a year later. After rebuilding, the new Y was lost in the great Chicago fire of 1871. Again, it was rebuilt. None of these 'Y' buildings included, oddly enough, a gymnasium. After his time with the YMCA, Hemingway established a real estate business in Oak Park, Illinois. 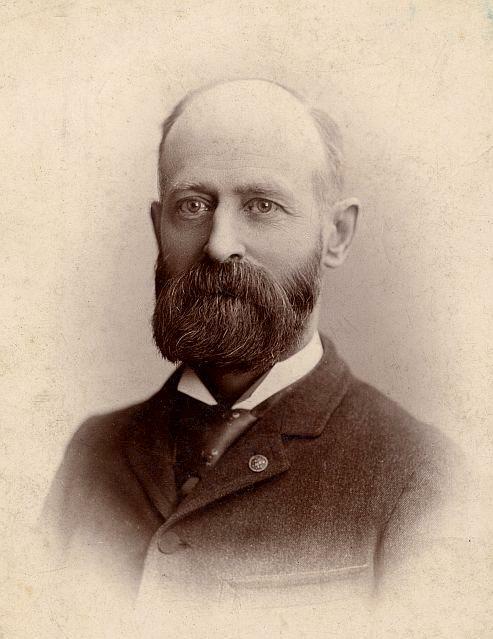 Anson married fellow Wheaton student Adelaide Edmonds, who graduated in 1867. Together they had four sons and two daughters. While living in Oak Park, they were members of the First Congregational Church. An avid outdoorsman, Anson gave one of his grandsons a 20-guage shotgun for his tenth birthday. 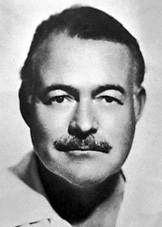 Anson Hemingway passed away in 1926 at the age of eighty-two. The grandson, as you might have guessed, was Ernest Hemingway (right), who, as one chronicler noted, later "had some success as a writer." (1) (2) Monument and Anson Hemingway, courtesy of Vicksburg National Military Park.